In winter, when conditions are ideal, Sauda offers fantastic winter activities for both children and adults. The short distance between Sauda and the various valleys makes Sauda unique. Enjoy a cup of coffee in the city and get lost in the views of the snow-capped mountains, and only 10 minutes later find yourself lacing up your ski boots. Sauda Skisenter lies 8 km from the city centre. During the ski season, there goes a bus from the city centre to the ski centre every day during the winter and easter holidays. The distance between Sauda – Haugesund and Sauda – Stavanger is made shorter by the ski bus and boat, respectively. 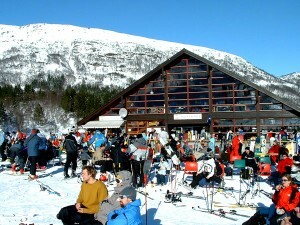 From Haugesund, there goes a ski bus every weekend to Sauda, provided enough people are interested. From Stavanger, one can take the boat. This is an all-inclusive package. Subject to enough people signing up.